I guess I just really needed a clean slate and what better way to do it than making a new instagram account. Well, basically, it’s not a new account. This was my account when I used to sell my old books for a good cause (I gave half the profit to charity). So yeah, it was such a hard task unfollowing and following everyone back again just so that I could filter out the audiences that I wanted for this one. 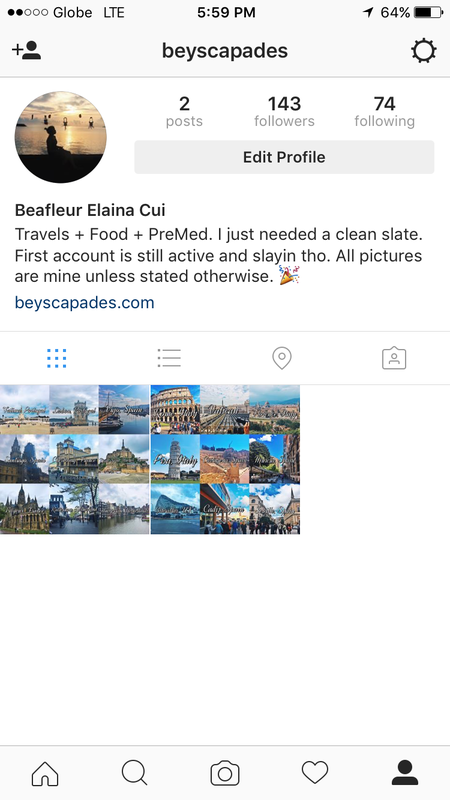 Basically, this account is for my travels + foodblogs + PreMed hype. What makes it different from other blogs? Well, the medical content that will be incorporated along with all of my wandering and my foodtripping. It’s a bunch of random things from the three that I hope will come together as an organized masterpiece. I hope you guys support me and follow this account and I hope to be blogging and instagramming a thousand more words and a thousand more pictures to share with all of you guys.